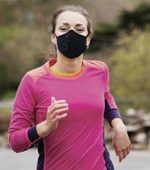 In one of our previous posts we brought out a comprehensive post on the Best anti pollution masks. Go through it and you’ll be amazed at the amount of research we have done. Warranty is 1 year from the date of purchase. Please contact customer care in case of any doubts. The Sharp FP-F40E Air Purifier comes in two colors- White and Brown. But, you may only be able to find the white color in market. White is a standard color in such devices. The looks are decent and the air purifier doesn’t occupy much space on the floor. The air suction mechanism is at the back of the air purifier. The air flow angle is 20°. Faster airflow at a 20º angle collects dust at lower levels in the room for more effective cleaning. The Sharp Air Purifier has a standard mesh pre-filter. There’s a deodorizing filter or what you know as a Carbon filter. 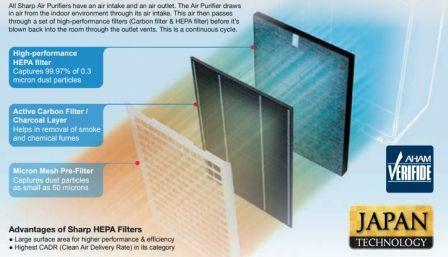 The quintessential HEPA filter does the majority of the fine particle cleaning. 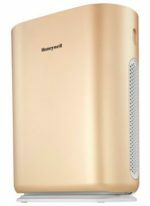 Sharp Air Purifiers sold in India are equipped with H14 Class (in EN1822 type) True HEPA filters, based on the JEM1467 standard of The Japan Electrical Manufacturers’ Association. 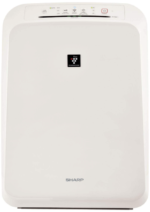 HEPA filters built to this standard remove 99.97% of dust and other particles of size 0.3um each time air passes through them. The filter life as advertised is about 12 months. Needless to mention that the filter life is all about how much polluted the air is where the air purifier is operating. Some best practices and precautions can help you extract the maximum life out of the filters. Never broom or do dusting with the air purifier ON. Always switch off the air purifier while cooking is on in the kitchen especially when oily stuff is being prepared. Do periodic cleanup of the pre-filter and if the other filters are washable too. 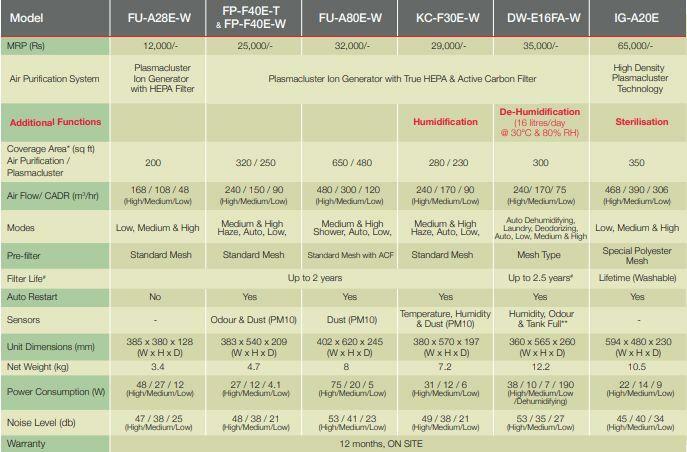 In case of Sharp Air Purifier, the pre filter is indeed washable but the HEPA and Carbon needs to be vacuum cleaned onl . The CADR for Sharp FP-F40E is 240 when the fan is operating at high speed. 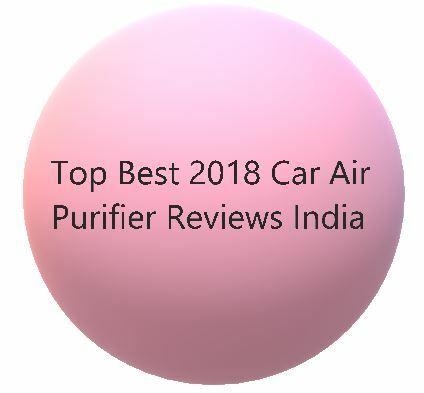 Compared to other air purifiers in the same price band like MI Air Purifier 2 (310) and Philips AC1215 (270), it is lesser. The Coverage Area is 320 sq.ft. As advertised, the air purifier can clean this much area in 15 minutes. This claim means that there is something fishy about the CADR rating. The CADR rating is indicative of the Air Changes per Hour (ACH) which is a minimum of 5. 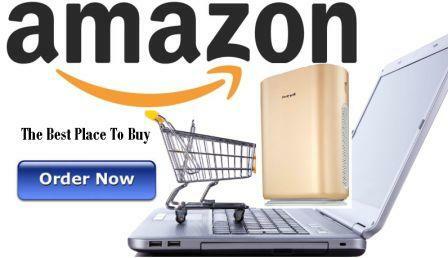 Sharp is a well-known Japanese multinational corporation that designs and manufactures electronic products. The Sharp Air Purifier FP-F40E doesn’t have any Real-time air quality indicator. It just has a color indicator which is a norm nowadays. Air purifiers which come with WiFi and APP functionality have PM2.5 displays. The display is either on the control panel or is visible in the APP. The MI Air Purifier 2 has this functionality via an APP. The Honeywell Air Touch i8 Air Purifier also has this feature. There is no comparison in terms of coverage, CADR or cost as such. The i8 model is the only model from Honeywell which has a PM2.5 on the control panel itself. The Air Touch S8 model comes with WiFi and the PM2.5 reading can be seen in the APP. Sharp FP-F40E Air Purifier has a sleep mode feature which can be used during night or sleep time. Sleep mode ensures s disturbance free night sleep. There is a 2/4/8 hour timer which lets you set the duration for which the air purifier will operate at a time. There is a sensitive laser dust sensor in this model. It senses the particulate levels in the room and helps the purifier. There is an odour sensor also. 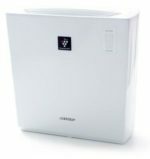 The Sharp FP-F40E air purifier restarts itself when the power supply is resumed after a power cut. This mode is like Turbo mode which is used when you want to clean the room’s air quickly. The fan operates in its highest speed. So, forget about noise, power consumption etc when you employ haze mode. You cannot get everything all the time! Note- MRP prices are only indicative. Activated Carbon Bags or Activated Charcoal Sacks- Clean Air Pollution?